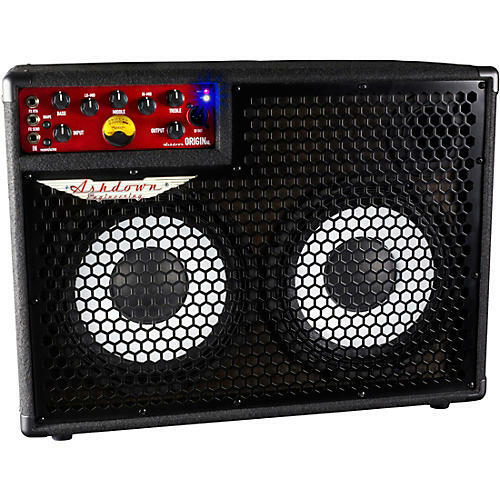 The Ashdown OriginAL C210T 300W 2x10 bass combo delivers the origins of the company's tone in a lightweight, portable package. It may be a sign of the times, but one simply cannot ignore that compact and lightweight are two key amplifier requirements of the modern bass player. Weighting in at a tiny 32 lb. (14.5kg), Ashdown's OriginAL combos tick all of the boxes. Each OriginAL combo is loaded with Ashdown Whiteline speakers, proven to deliver Ashdown's signature bass tone, with clarity and transparency that cuts through. Ashdown's OriginAL C210 provides full power to its internal 10 –inch speakers. Dimensions: 16.53" x 23.22" x 14.96"